Cincinnati Milacron “CINCO-15” mdl. DR Centerless Grinder s/n 350200080-0048 w/ 24” Grinding Wheel, Dial Regulatory Feed Wheel RPM, Hydraulic Grinding Wheel Dresser, Hydraulic Feed Wheel Dresser, Coolant. Cincinnati Milacron “CINCO-15” mdl. DR Centerless Grinder s/n 350200079-0038 w/ 24” Grinding Wheel, Variable Speed Bearing Drive Regulator Feed Wheel, Hydraulic Grinding Wheel Dresser, FeedWheel Dresser, Coolant. Cincinnati Milacron “CINCO-15” mdl. DR Centerless Grinder s/n 350200078-0060 w/ 24” Grinding Wheel, Variable Speed Bearing Drive Regulator Feed Wheel, Hydraulic Grinding Wheel Dresser, Feed Wheel Dresser, Coolant. Cincinnati Milacron “CINCO-15” mdl. DR Centerless Grinder s/n 35020005W-14 w/ 24” Grinding Wheel,Variable Speed Bearing Drive Regulator Feed Wheel, Hydraulic Grinding Wheel Dresser, Feed WheelDresser, Coolant. Cincinnati Milacron “CINCO-15” mdl. DR Centerless Grinder s/n 35020005V-0019 w/ 24” Grinding Wheel, Variable Speed Bearing Drive Regulator Feed Wheel, Hydraulic Grinding Wheel Dresser, FeedWheel Dresser, Coolant. Cincinnati Milacron “CINCO-15” mdl. DR Centerless Grinder s/n 35020005V-18-R-71 w/ 24” Grinding Wheel, Variable Speed Bearing Drive Regulator Feed Wheel, Hydraulic Grinding Wheel Dresser, FeedWheel Dresser, Coolant. Cincinnati Milacron “CINCO-15” mdl. DR Centerless Grinder s/n 35028H5U-58 w/ 24” Grinding Wheel,Variable Speed Bearing Drive Regulator Feed Wheel, Hydraulic Grinding Wheel Dresser, Hydraulic FeedWheel Dresser, Coolant. 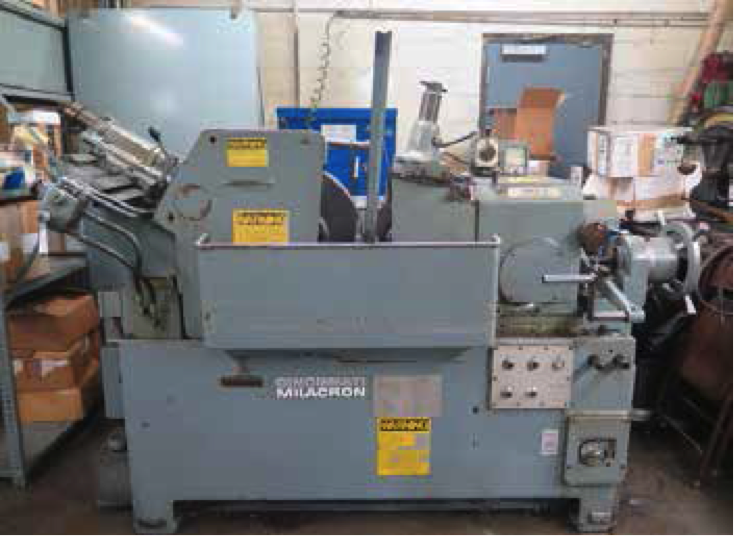 Cincinnati Milacron “CINCO-15” Centerless Grinder s/n 35028H5U-0024 w/ 21” Grinding Wheel, VariableSpeed Bearing Drive Regulator Feed Wheel, Hydraulic Grinding Wheel Dresser, Feed Wheel Dresser,Coolant. Cincinnati mdl. OM Centerless Grinder s/n 2M2H1V-62 Centerless Grinder w/ 24” Grinding Wheel, Hydraulic Grinding wheel dresser. Reed / Litton No. A22B 3-Die Cylindrical Thread Rolling Machine s/n A22B-1809 w/ .250”-3.75” Work Diameter Cap. Waterbury Farrel No. 30 Flat Die ½” Cap Thread Roller s/n 1045. Waterbury Farrel No. 30 Flat Die ½” Cap Thread Roller s/n 2S-46L. Waterbury Farrel No. 30 Flat Die ½” Cap Thread Roller. Waterbury Farrel No. 10 Flat Die ¼” Cap Thread Roller s/n 25333-982. Waterbury Farrel No. 10 Flat Die ¼” Cap Thread Roller s/n 143405-1729. Waterbury Farrel No. 0 Flat Die Thread Roller s/n 5239-999. Waterbury Farrel No. 0 Flat Die Thread Roller s/n 373. Waterbury Farrel No. 1-B Flat Die Thread Roller s/n 8986. Thread Flat-Die and Cylindrical Roll Dies.Centerless Grinding and Feed Wheels.Hardinge Narrow Bed Turret Assy. Brown & Sharpe Screw Machine Collets. Brown & Sharpe Gears and Cams. MicroVu mdl. H-14 14” Floor Model Optical Comparator s/n 3500 w/ MicroVu Q16 Programmable DRO, Surface and Profile Illumination. MicroVu mdl. H-14 14” Floor Model Optical Comparator s/n 517 w/ MicroVu Q16 Programmable DRO, Surface and Profile Illumination, 5” x 18” Table.MicroVu mdl. H-14 14” Floor Model Optical Comparator s/n 1834 w/ MicroVu MD-1 DRO, Surface Illumination. Cadillac Pla-Chek 24” Height Master. Brown & Sharpe Ultramatic R/S ¾” Cap Automatic Screw Machine s/n 542-00-9363-3/4 w/ 6-Station Turret, (4) Cross Slides, Lipe Pneumatic Bar Feed, Coolant. Brown & Sharpe No. 2G Automatic Screw Machine s/n 542-2-602 w/ 6-Station Turret, (3) Cross Slides, Coolant, CNC Enhancements “Hydroturn” Automatic Hydraulic Bar Feed and (6) Liners. Brown & Sharpe No. 00G 1 ½” Cap Automatic Screw Machine s/n 542-0-222 w/6-Station Turret, (3)Cross Slides, Coolant, Bar Feed. Brown & Sharpe No. 0G Automatic Screw Machine s/n 11628 w/ 6-Station Turret, (3) Cross Slides, Lipe Pneumatic Bar Feed, Coolant. Brown & Sharpe No. 00 ½” Cap Automatic Screw Machine s/n 542-00-7785 w/ 6-Station Turret, (3) CrossSlides, Bar Feed, Coolant. Brown & Sharpe No. 00 Automatic Screw Machine s/n 542-00-4122 w/ 6-Station Turret, (3) Cross Slides,Microflex Counter, Bar Feed, Coolant.